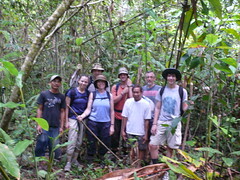 We used to be able to walk to our clearing and study area in about 1.5-2 hours from the closest village of Sirisurak. But on this trip, after two hours of cutting through the vegetation (and my daughter and I being attacked by a swarm of hornets), we were still far away. It was clear that ‘our’ river is now rarely visited by anyone and deer tracks are numerous. Without our old friend Potifar we would never have recognized our clearing because it is now mature secondary forest. Although he was able to tell us where our kitchen and veranda had been, the only sign of our life there were the nails we had hammered into the plank buttresses of the nearby giant Sterculia tree from which we had hung orchids. 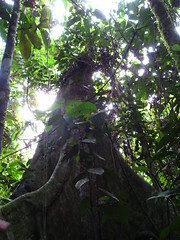 Although there had been some earlier clearing of the flat forest in our study area (including the plots where my wife Jane used to trap her rats and squirrels) to plant patchouli, the forest in the core of our study area was still absolutely magnificent with towering dipterocarp trees reaching up to 60 m and higher. The biggest conservation change over the last 30 years has been the establishment of the 195,500 ha National Park. This should be good news because national parks get fairly generous budgets from the central government, but about 80% of the park staff live and work in the provincial capital on the mainland of Sumatra. This is over 150 km, 12 hours by public boat and another day or so of boat and foot travel from the closest part of their park. Since most of their budget is for salaries, it is not surprising that most of the budget never actually gets to Siberut and produces very little in the way of conservation outcomes despite the best efforts of the local staff. This is not just an outsider’s view but also that of the park’s new Director, Mr Jusman, who is working effectively with local and international NGOs interested in Siberut conservation. Some of the earlier conservation efforts on Siberut had not given adequate time to getting clans and broader communities behind the conservation agenda. Mistrust was bred and it has taken nearly a decade to begin to heal, mainly through the consistent, patient and community-oriented work of UNESCO and partners (pdf). UNESCO has an interest in Siberut because the whole island was named one of its Man and Biosphere Reserves in 1981 and their long-term consultant Koen Meyers has been successful in raising appropriate amounts of grant money. As mentioned in the previous post, the World Bank had implemented the Critical Ecosystem Partnership Fund and $1 million from the first phase was committed to NGO-executed conservation on Siberut. 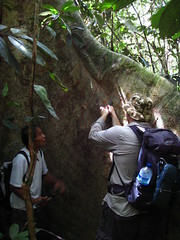 The final reports from 2003-2005 can be found on the web, but they are listed with similar reports from other parts of Sumatra. In talking to grantees and government officials I found that, as one might expect, there had been a variety of impacts. The first problem was that there was no overarching, coherent, prioritized strategy for work on the island and the different grants did not really ‘join up’. Some of the grants were for efforts that were too small or too short-term to make any lasting difference. That said, there were some marked successes and the CEPF support for the Mentawai newspaper Pualigoubat has been sustained from other sources, and a local NGO, PASIH, arose and continues to support the national park and communities. The most important outcome was to produce a long-term presence and commitment amongst local and capable conservationists, and there is thus a small, young generation of local people who understand the conservation agenda for Siberut. One of the CEPF grants was given to the German Primate Center but I’ll write more about that next time.